Dr How's Science Wows: Just a thought - "a fistful of love!" Just a thought - "a fistful of love!" This lovely saying was posted by @5_Phases via twitter last week and it came to mind again today as I strolled home in the beautiful sunshine with my little three year old. We were admiring some flowers in the hedgerow and my little companion decided he would like to bring some flowers home for his convalescing daddy. After the delay of Summer in this Country it is uplifting to see all these little bursts of colour emerging in the hedgerow. 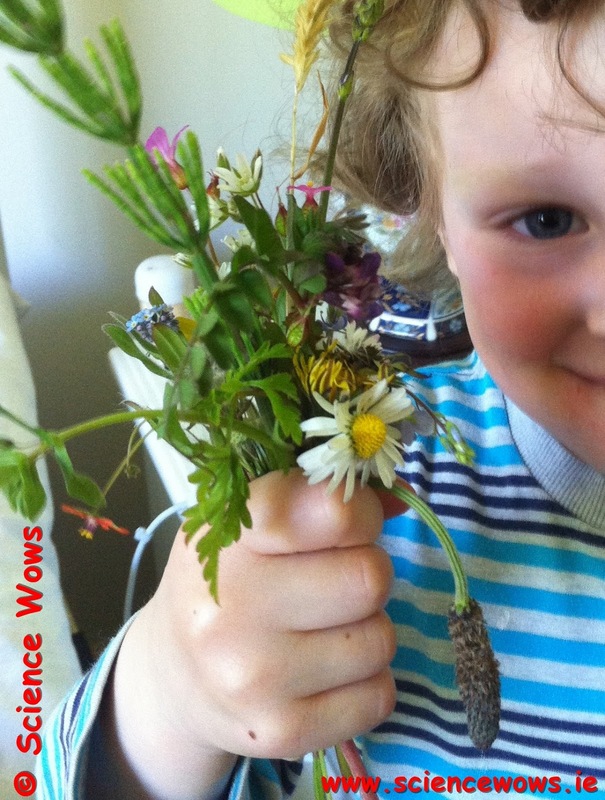 It is amazing how many different flowers we came across on our slow half mile walk home from playschool! This little fistful includes dandelion, buttercup, daisy, herb roberts, forget-me-not, speed well, scarlet pimpernel, vetch and horsetails. Anyone who has been following my blogs will be aware of my loose definition of a weed and my delight in all these little hedgerow friends. We often look to the exotic and rare in the pursuit of beauty but if we take a moment to bend our heads and look into our local hedgerows and grassy verges we can find an abundance of beauty in the common, local and tiny plants that grow there. Many of these plants held symbolic and medicinal value to our ancestors, perhaps I will explore these lores and legends a little further in individual blogs about some of these little delights, what do you think? If you have an opinion, a suggestion or some information to share on the topic please drop me a note in the comments below!